Serendipity and a little research yield the damndest things, on your way to writing about this music. It turns out I first heard Ernst Karel in 1991 when he was a 21 year old trumpeter playing under the alias Ernst Long. I was entering a hiatus, at the onset of that new decade, from listening to free jazz/improv, burnt out following a decade and a half of unchecked avidity and unchecked vinyl consumption. I was checking out a little rock music for the first time in a long while, which led to the Seattle bands Green River, the Melvins, the fantastic Screaming Trees and the Puccini of that scene, Soundgarden. Soundgarden’s Badmotorfinger was in frequent rotation that year. The trumpet player on that date-Ernst Long, a.k.a Ernst Karel. The trajectory from serving as a session musician on that date, to his current gig as the manager for the Sensory Ethnography Laboatory and Film Study Center at Harvard, is undoubtedly worth charting. The trumpet prevailed throughout the ensuing 18 or so years, part of Karel’s instrumentation in the excellent improvising duo EKG, his long-standing collaboration with Kyle Bruckmann. I first heard EKG about 5 years ago, and have very much enjoyed the three releases under that name since then. They are a genuinely electro-acoustic partnership, Bruckmann contributing oboe and English horn, as well as analogue electronics, Karel moving between trumpet and electronics. Erasure [the lines drawn between composition and improvisation, between orchestral and electronic sound sources] is their unfussy metier, and they have established a small, superlative body of recorded work. The trumpet cannot be found in Karel’s 2010 releases, Heard Laboratories [And/Oar], or Falter 1-5, Karel’s duo with Annette Krebs [Cathnor]. 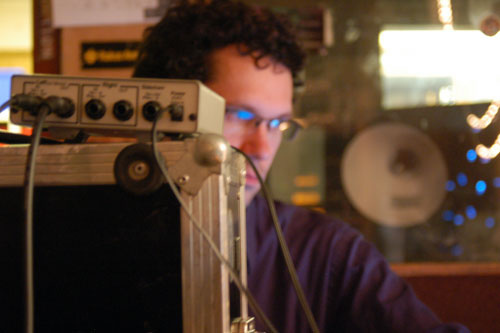 Karel has varied interests in sound exploration, and there is no place for his playing at all in Heard Laboratories. So what is he up to, sans trumpet, prowling the research labs of Harvard with carodid mics and inarguably acute ears? Heard Laboratories presents Karel the researcher, documentarian and abstract musician, foregrounding the sounds of science-the sounds of the labs, the frequently goofy looking, Grade B sci-fi apparatus that conducts the research carried on at Harvard, and, as intermittently as the co-equal sounds of tamarins getting their cages cleaned, or the jarring burst of a telephone ringing, the transient sounds of the humans doing the research. With an equanimity and dispassion that would please Cage, all of these sounds are captured, unprocessed, then edited into five pieces. When I say Karel was prowling, I mean it-only one track [an in situ recording of the cognitive evolution lab] involved a stationary mic. The other pieces were realized with Karel wielding hand-held mics, threading his way through rooms rarely visited by anyone outside of their specialized resident researchers, much less someone documenting the physical process that undergirds everything from chemistry labs, an MRI room, and, most distressingly for this listener, the squeals and cries of monkeys in the cognitive evolution laboratory. It is Karel the researcher, who once aimed his mics at the sounds of Kerala in South India, doing doctoral research in the anthropology of sound, now micing his colleagues at Harvard for our listening…pleasure? Is there an intention beyond whatever pleasure is yielded by the raw sounds themselves? 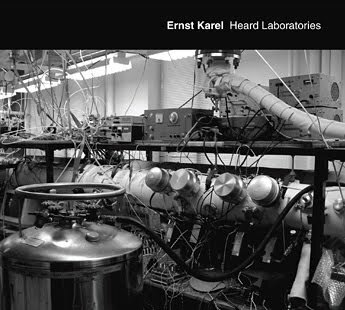 I have not asked Karel this directly, wanting to hear Heard Laboratories for myself before reading what he might have to say. It is one of several questions that arose for me as I listened through these five pieces. Does foregrounding sounds typically unheard or passed by without our attending to them necessarily result in sounds that merit our attending to them, much less music? Of course not. The highest concept cannot offset sounds that do not engage us, whether by prepossessing us in the cognitive realm, or in a more visceral and intuitive way. Karel’s concept, as I take it anyhow, is that there is something engaging and gripping in the most quotidian and therefore ignored sounds in our environs. What Karel does is present these environments-from an egocentric perspective, the frame around our self-centered worlds- with a little editing, for our consideration. Well, Karel comes across as both the Gregory Bateson of EAI [Bateson was immensely popular with myself and the non-anthropology students I hung out with, his meta-koans perfect for our stoned, close attentions], and, perhaps more apposite, much like verite film documentarians who make you intimate with previously unknown worlds. In this sometimes thrumming, sometimes plangent sound world, sentience and science cross fade; animal cries and yelling humans, the mechanized rhythm of an MRI [a claustrophobia-inducing sound many of us are familiar with], the ambiences of academia. The phototonics lab [track 5] evokes the industrial drones of Eraserhead. The work does not take a position with respect to what is documented, and neither endorses nor criticizes the research programs of the laboratories which granted access. Clearly this statement of artistic neutrality on what is documented by Karel anticipates possible questions about the role of the artist and the label on the ethical/political/social dimensions of what is documented. Again, I refrained from querying either Karel or And/Oar label head Dale Lloyd prior to this, wanting to hear Heard Laboratories for myself and reflect on some of these dimensions of this sort of sound work. I know Lloyd has become even more committed to And/Oar focusing on location recordings and field studies, saying the imprint will …contribute to breaking down the long held beliefs of what can be considered as music…expanded to include all sounds that can be enjoyed for various reasons. Splendidly, to my ears. There is immense serenity, dark and unsettling goings on, and the simple hum of efficiency captured in these five pieces. These are environments previously unmet, fully alive and frequently mysterious. As for Karel’s editing, the shaping of these unprocessed sounds recalls Truman Capote’s line, I believe more in the scissors than I do in the pencil. Heard Laboratories is a strong statement, released by a strong label committed to documenting artists who hear music in their own, immediate spheres. But as Reading Rainbow host Levar Burton said, following every endorsement of the children’s books he presented to his young audience- You don’t have to take my word for it… read it for yourself. You might find a whole other set of concerns arise, including how is this music? Should the documentarian be neutral in those rooms? Or none of these. And I didn’t miss the trumpet once. Heard Laboratories can be ordered here. Photo of Karel by Susanna Bolle. This entry was posted in music writing on June 8, 2010 by jessewgoin. Epic! Thanks for your considered insight Jesse. I see your point regarding the label mission statement, so I have altered it slightly to allow for releases that might not be “enjoyed” in the standard entertainment sense of the word, but “enjoyed and/or pondered” for a number of reasons. I also want to make it clear that no tamarins were being harmed in the recording you mentioned. They were just part of the environment captured on that particular track. I appreciate the clarification, Dale. Just to be clear, I stated I was distressed by the cries of the monkeys in a research lab; I in no wise drew a conclusion that they were harmed, but given the context, it raises that question. And/Oar is a stellar label, and I don't want to impugn your work in the slightest.